Aberbran Fach Campsite has been running for 50 years. The site has been expanding over the past ten years with more electrical pitches available and hard standings. The site holds 14 electrical pitches with a choice of grass or hard standing. 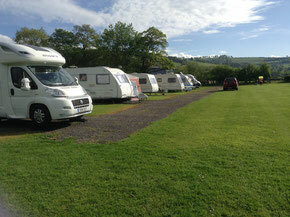 Seasonal pitches are now available with electric hook up! There is a heated shower and toilet block on the site with hand dryers. 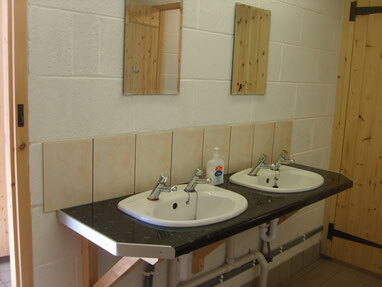 Washing up facilities are available with hot water. Rallies, special occasions and group holidays can be arranged on the meadow alongside the relaxing river Usk. Fires are allowed on the site and logs can be purchased. 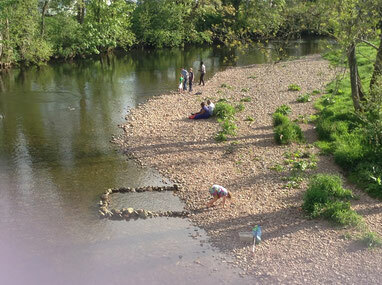 The campers of Aberbran Fach have access to the river. Aberbran Fach is also a working farm with many busy events throughout the calendar year. During the Easter period, the sheep are busy giving birth to their baby lambs. The months of May and June see the new arrivals of baby calves and the Summer months are taken up with lots of harvesting and the smell of fresh cut grass. A variety of homemade cakes available to order for your stay or to take home with you. Choose from a selection of traditional sponges, tray bakes or celebration cakes for that special birthday.